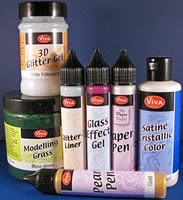 Make sure that you don't miss the new product that Susana has in store for us from Viva Decor. My sister Louise have been asking me for a very long time to make some memory boxes for her daughter Julia. We'll - I did not have any more excuses when I saw these supercute DPs from Making Memories. I had to have them and made 3 little boxes for Julia - to save her keepsakes in. I made a matching card - featuring Young Cathrine with friends. Coloured Cathrine and the little chickens with my copics. 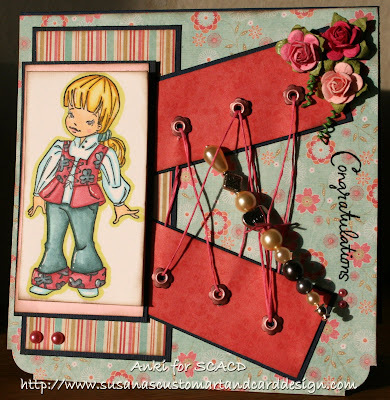 Added a Doodlebug ribbon and sentiment "Memories" from SU. 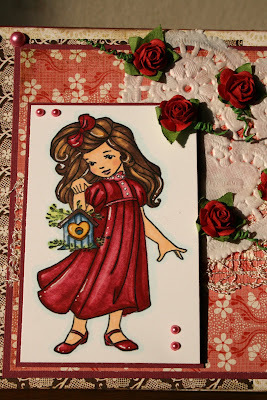 Also - hope you have not missed the new Spellbinders 2010 , Tsukineko Psst Spritz and new cute images from Pink Cat Studios!! Do you want more? Well - I can't tell you anything today - but a hint is that you should be checking the store blog out tomorrow for a fun new product! Welcome to another TIOT! 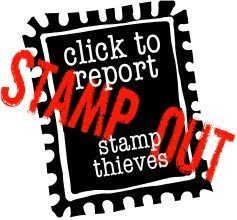 This week Suzanne wanted us to show the versatily of holiday stamps. Well - many of you might have thought that this cute little girl - Irish Eyes - only would be perfect for St Patrick's Day? Hm..nope..... I think she's so supercute that she would be perfect on any card. I used her for a b'day card to my niece Victoria and she loved it! It's also time for another RoP/BnW challenge. This time I got the honor to be the hostess and I challenged the team to make a card for a boy/men. I decided to ink up and colour "Surprise". Coloured him with my copics. DPs from Making Memories that was a freebie from Cardmaking and Papercraft. Sentiment from Aud Design. Hope you like it and make sure that you check the rest of the DT creations. Here's todays report from Sweden. We are def. snowed in. It was been a total chaos in Sweden yesterday and not all roads are cleared yet. There's 1meter of snow on our long driveway - so there's no chance that I will be able to get out. Well - that's the snowreport for today. Now over to the card - if you remember - my blog friend Renata was asking her blogfriends to create a card for little Daan. Daan is 4 years old and has a brain tumor - which is sadly incurable. This is what Isac and I came up with - using the image "Isac the soccerplayer". Isac wanted Daan to be in the Dutch soccerteam - so therefore he got the Dutch colours on his outfit. I hope he will like it. My thoughts and prayers are going to Daan and his family. 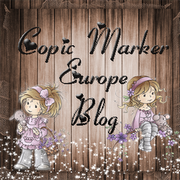 Thank you all for your very sweet comments and for joining our blog-hop yesterday. Here's a quick post from me today. We've got at least 25 inches of snow yesterday and it's going to snow the whole day today. I love snow - but this year we've got more than enough - I'm ready for Spring! Talking about Spring - I would like to show you one of the new images that were released yesterday - New Friends! Isn't this a wonderful image! I totally love it! Flowers - mini roses and flowers sent to me from my supertalented friend Marlene. 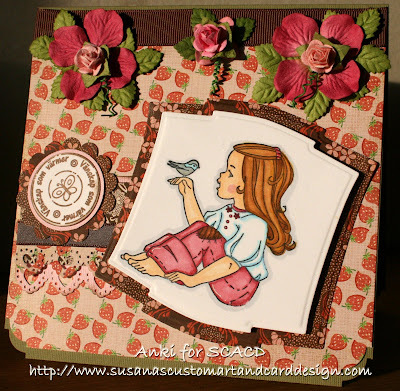 Welcome to our blog-hop for the very new, fresh and supercute SCACD release - Elisabeth Bell for SCACD - Sampler Edition 3. I got the honor to show you this little cute girl holding a birdhouse. This image is called Heartstrings. I just love it! She's supercute and I'm sure you are going to fall in love with her too ;-) I coloured her with my copics. Used my Basic Grey DPs and my Martha Stewart heart punch. 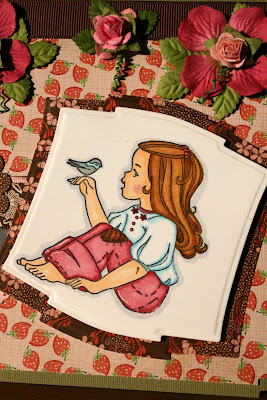 Added a heart shaped cake paper behind the cute little girl and a piece of lace. Decorated the paperheart with several mini-roses - can't get enough of them :-) and some pearls of course. Hope you like the result! Would love to hear from you before you hop to our talented Marti's creation. 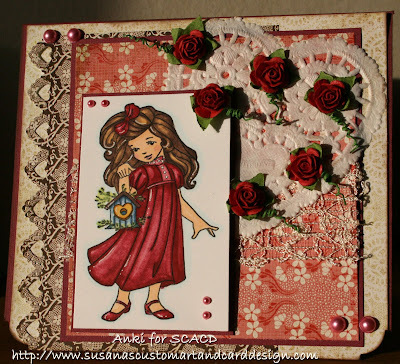 It's time for another Try it out Tuesday and this week Suzanne wants us to only use 3 layers on our cards. 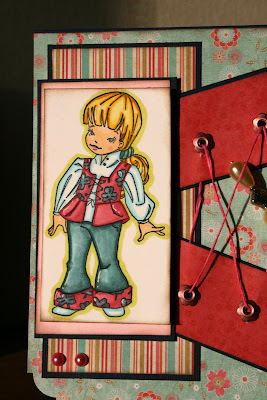 Well - that was easy for one's - since I stamped and coloured the supercute and cool Fashionista. I coloured her with my copics. Added a few pearls and then of course the wonderful Prima roses. Can't have enough of them and luckily - Susana have a lot of new Prima flowers, jewelry and swirls in her store. She also have a lot of other new items that you want to check out - so I'm sure you will go shopping. Also - the reason why I know that you will be shopping after this week - is the upcoming release with the new cuties from Elisabeth Bell! I love them already and I can't wait to show them to you - starting our blog hop - Feb 19th! I decided however - that Fashionista - already did some shopping - waiting for the cuties to arrive and she got herself a corset ;-). Well - this is actually a corset bag that I made in the matching DPs. I purchased the tutorial here. Make sure that you check out what the rest of the DT girls been up to and make sure that you don't miss the blog candy that Susana has in store for you! She's celebrating the new E Bells and over 40 000 hits on the store blog! YEAH! Candy time over at SCACD! Do we have some fun planned for you this week? The answer is YES! First of all - Susana is having a great candy up on the store blog starting today! She's celebrating the new release of more E Bell designs and an amazing number of visitors to the store blog! Don't miss the chance to enter. Read all about it HERE. Then we will have a blog hop ready for you Feb 19th - showing you all of these cuties! I promise you - you will not want to miss this - so make sure that you stay tuned! And I hope you all are having a great day with your loved ones! Here's a little set that I made for a loved one - my cute little niece Julia! I stamped and coloured little "Smile". Made a "mini-card" with the same DPs as I created the little babyshoes with. The babyshoe template is one that I found here. I think they are so stinking cute - don't you? I loved making them so I warn you - you will see more babyshoes in my blog ;-). I added two mini-roses on the sides - as you can see. It's time for another challenge - and as we all know - Valentine's Day is getting closer. Suzanne challenged us to use the colours Pink, Red and Purple. I inked up cute little Daisy and coloured her with my copics. Picked up matching Basic Grey and Kaisercraft DPs. Added Hydrangeas and pink miniroses in the center. Here's a close up of little Daisy. If you look closely - you can see that I tried the feather technique shown on the copic creations blog (where Susana is sponsoring the fab prize). Kram and hope that you will join us. PS. Sorry for the short post - but Isac is still having high fever and need his Mom. Yes - it's time for another RoP/BnW challenge. This time it's Susan that decided to challenge us with the colours Pink, Brown and Cream. But before I tell you more about the card - I need to say HAPPY B'DAY Victoria (my niece) - who turns 11 today! I decided to use my new Basic Grey DPs together with my little Anya from the Rain, Snow and Shine collection. Coloured her with my copics and added highlights with my white gel pen. Sentiment - Memories -from SU. Punched out matching flowers and added pink pearls in the center. Also - sorry for the very short post today - but Isac came down with fever yesterday - so he's been "glued" to his Mom. Looking fwd to see what you will come up with. It's getting closer and closer to Valentine's Day and I decided to make this little Valetine's box. I purchased the tutorial regarding the box from Becky. Must say that I'm pleased with how it turned out. The tutorial for the post-it-note holder is from Angie Juda. Here's a close up. Close up of the altered matchbox and candle. Close up of the chocolate. Made the box out of acetate sheet. I also made a matching card to go with the box. 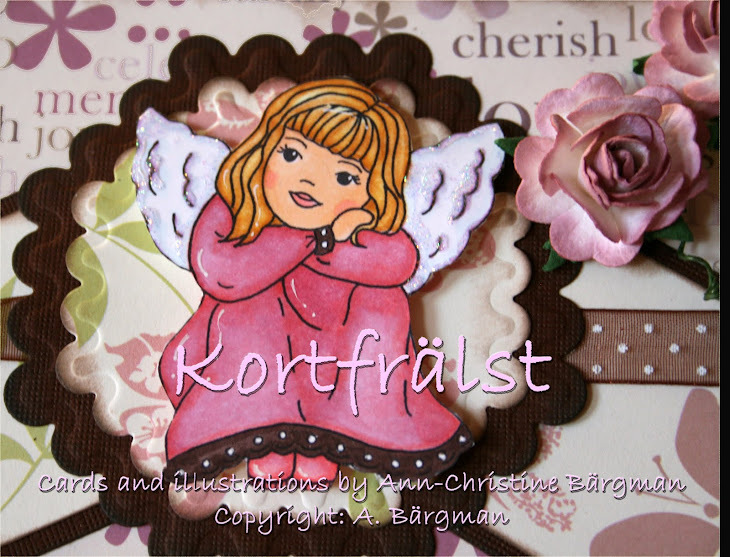 All supplies are from our local craftshop Pysselakuten - except the Ribbon and 3 of the stamps - they are from SU. Hope you like it and try to make one yourself. Here's a card that I made for our local shop - Pysselakuten. 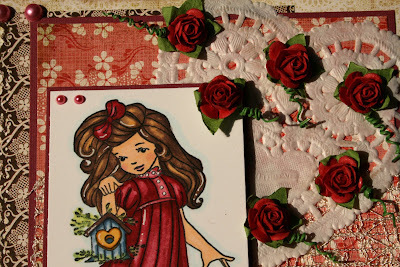 The cute little stamps is one of the stamps that were in the latest Cardmaking and Papercraft magazine. Isn't he just stinking cute!!? Added some flowers, pearls and a ribbon - and there you have it! Must say that I am pleased with this one. Hope you like it and looking fwd to hear from you as always! and so is another Try it out Tuesday. 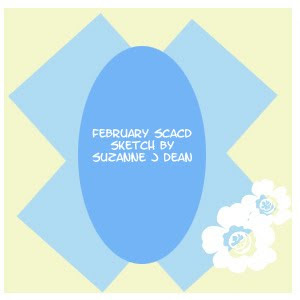 This week we are going to use Suzanne's fun and fab sketch below. After a long day at work and then almost 3 hours on our garage roof (yesterday afternoon/evening) I decided that I was longing for Spring ;-) So it was just perfect that I received my order from Susana with the new Basic Grey DP - Sugar Rush last week! Love them and the other DPs I ordered. I coloured sweet Emma with my copics - just love her and cut her out. Then I cut two circles with my nesties - one round and the other scalloped - since I wanted it to look like a huge flower. Layered Emma in front of them. Added a few Bella Baubles and prima flowers. Yes - I received my mini prima roses from Susana and I know that I will be coming back for more soon :-). My dear blogfriend Renata asked me if I could help her to get the word out for a young little guy - Daan. Daan is 4 years old and has a brain tumor - which is sadly incurable. Read more below from Renata and I hope you will join us and support this little boy in his struggle. "Dear blogfriends, I know you all love to make cards so what's better than to do something you realy enjoy and at the same time make a little boy happy in the most difficult time of his young life? Daan, the son of my sisters friend, is 4 years old and has a brain tumor which is sadly enough incurable. More and more body functions fail such as his legs can't carry him anymore. At the moment he gets radiation because his parents and the doctors will make his life as easy as possible and of course no one will loose hope! I think it is heartbreaking and I'm so sad that I can't do anything to help him! That's why I aks you girls to make him a funny card so he has something good to look forward to and I think it will help his parents and two little sisters (Sacha (6) and Anna (2)) as well. I also want to ask you to keep him in you prayers or send a little positive energy and thoughts to him, because you never know! 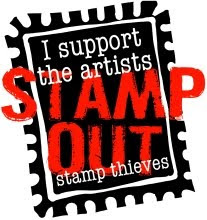 Do you want to join in this small gesture, please send an e-mail to creatiefonline@upcmail.nl so I can send you the address you can send the card to. I like to thank you from the bottom of my heart! Love, Renata"
I know what I will be doing first thing tomorrow after work - a fun boyish card for Daan. I'm sure Isac will help me too - he love making cards and being the same age as Daan - then he def. know what a 4 year old boy will like. I hope you will join us for this good cause! My thoughts and prayers to Daan and his family.